Add a vibrant burst of color to your wardrobe with this bottle green pant style suit. The desirable embroidery work on the attire is eye catching. 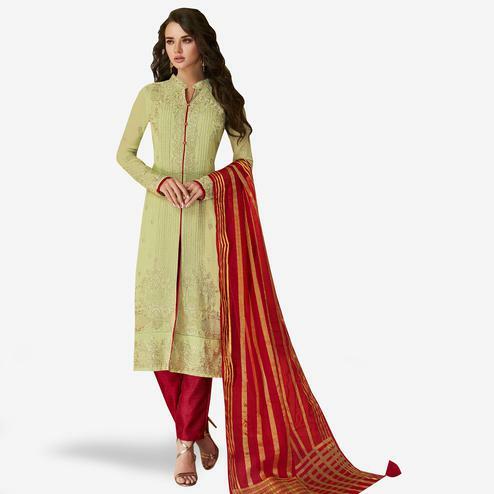 Comes with embroidered pant style bottom fabric and beautiful dupatta with border to complete the look. The top is of faux georgette paired with dull santoon lining & bottom along with chiffon dupatta. It's a perfect suit to wear for family functions, festivals and occasions. Pair it up with classy accessories and heels to make your look more attractive. Get this dress now before it's gone out of stock.